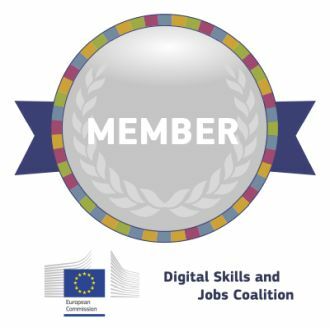 The European Information Technologies Certification External Programme (EITC X) is a novel standard upon mainstreaming approach to IT certification introduced by EITCI Institute in response to problems diagnozed by the European Commission regarding the digital gap in the EU and international barriers for Digital Society formation, within the efforts to overcome this digital gap and barriers upon the Digital Skills and Jobs Coalition initative. The EITC X is an internationally acknowledged EU formal IT Certification standard defined upon the framework of the European information Technologies Certification, EITC, within the initiative of the Digital Skills and Jobs Coaltion, DSJC initiated by the European Commission in October of 2014 (cf. more details). Why there is X in the EITC X Programme name? Because you can earn your standardized EITC X Certificate just by completing a relevant EITC X accredited external IT course implemented by EITCI accredited provider on-line or off-line in whatever language it is offered in. It doesn't matter in which country and language you take your relevant IT course and its related training. If it is accredited in EITC X Programme, you still can earn your Brussels issued EITC X Certification, attesting in English completion of the relevant course you finished. This attestation rises your IT competencies formal acknowledgement to a new level in comparison to only the provider issued proprietary confirmation or certificate, due to leveraging on the international recognition of the EITC EU standard implented by EITCI Institute. You can validate your EITC X Certificate on-line by either fully automated QR Code scan, by entering your Certificate ID and last name in web form validation (on https://eitci.org/validate) or by using your secure Certificate URL validation token. You can use on-line integrated validation to effectively present your EITC X Certificate, e.g. in the integrated IT ID e-CV standard or within LinkedIn global professional social network, where EITC X Certificates are officially recognized, or perhaps just during a job interview. You can buy your EITC X Certificate from the accredited IT course provider or directly from EITCI Institute within EITCA Academy (in latter case you will required to submit data of completion of the corresponding IT course for the IT course vendor verification). Holding EITC X Certificate you get an on-line European IT Certification profile on the EITCI Institute pages. This profile you can reference on your social networks, within your CV or during job interviews and it comes integrated with IT ID e-CV standard for streamlining multimedia presentation of your IT competencies and portfolio. With EITC X Certificate you also get a Certified Member access to the EITCI Cloud platform of the European IT Professionals community connecting you with other IT experts and certification holders, as well as hiring companies, recruiters, managers, CEOs, investors, etc. for your career development and focused social networking. Finally EITC X Certificate as any other EITCI issued Certificate additionally admits you to an optional EITCI institutional membership with a lowered annual fee, if you will be decided to complement your professional career development with a formal membership in the professional European IT association dedicated to Digital Society. All issued EITC X Certifications are digitally integrated with the EITCI Blockchain Certification Architecture, so the holders can rest assured that their Certifications will be never lost and will remain integrated within the recursively defined and distributed Blockchain architecture for preservation and sustained security. The EITC X certification framework is based on accrediting of external high quality IT courses implemented either on-line or off-line and developed by educational providers not affiliated with EITCI Institute and not licensing EITC/EITCA Certifications. The IT courses qualifying to the EITC X accreditation meet certain quality criteria and are generally acknowledged on the market. The evaluation of eligibility is performed by the Certification Committee of the EITCI Institute either on request of IT course provider or by selection of the relevant course by EITCI Institute. The courses eligible for the EITC X Certification accreditation must be offered on the EU market in any of the EU official languages. EITC X framework is elastic to the programme coverage extent and the certification defines the curriculum accordingly with the course didactic contents. If the contents of the course is qualified to the programme and positively undergoes the accreditation, than any individual finishing the accredited IT course is entitled to earning of the relevant EITC X certification. EITC X serves thus as a certification of accredited course completion and not additional objective verification of the attained knowledge by the relevant course participant (the EITC X certification does not involve examination or any other form of attained knowledge verification). It is a certification of relevant IT course completion that can be further extended to EITC or EITCA knowledge veryfying, examination based certifications. EITC X constitutes an internationally recognized and acknowledged attestation of life long learning in IT mostly oriented at vocational training. EITC X certificates can be obtained seperately or in series if relevant training programmes are sufficiently advanced and comprehensive. The standard is targeted at all individuals either delegated or self-interested in completion of IT courses by quality IT education and training providers. An accrediting body for the European IT Certification External Programme is the European Information Technologies Certification Institute in Brussels, Belgium. For any additional details and inquiries please contact us. If you represent IT courses provider (i.e. any education oriented organization providing vocational or general IT related training) and would like to apply for the EITC X accreditation for the courses in your offering, please submit the EITC X accreditation registration form.